History is kind to the victors because they write the books. In this book, author Kelli Estes tells the story of those who were vanquished, that of early Chinese immigrants to the American west coast areas. Inara Erickson has inherited her aunt's estate and plans to turn the large home into a boutique B&B. While renovating, she finds an intricately embroidered sleeve. She suspects it might have historical significance and turns to professor Daniel Chin to help uncover its provenance. I could not stop listening as the hidden story of the mistreatment of Chinese immigrants was unraveled. Many unethical and even criminal acts were committed and had be lost or buried in time. The story moved quickly once Inara and Daniel started uncovering the clues to the truth. I was captivated by this tale. Once I started listening, I didn't want to stop and would find excuses to keep listening to the audio book. Narrator Emily Woo Zeller brought the characters to life for me even long dead Mei Lein. She presented her in a calming voice but was clearly able to invoke the anguish that she must have felt during her most trying times. It was interesting to read how both Inara and Daniel handled the deceit of their ancestors and how they learned from those came before them. We don't have to repeat the lies and faults of our ancestors, we can forge our own futures. While The Girl Who Wrote is Silk is a work of fiction, it is loosely based on an historical account of the fates of Chinese immigrants to the American west coast. 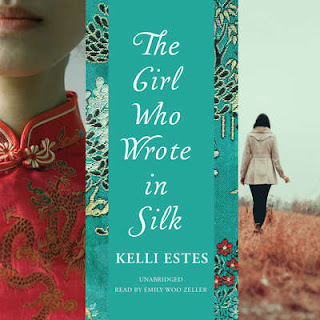 I listened to the unabridged audio book as read by Emily Woo Zeller. 12 hours 21 minutes. Blackstone Audio. I always enjoy historical fiction from an area unknown to me! this is a new subject for me and I will certainly love to read this book. Making it a note of it. Thanks for the review.